Onet Valley has released Phnom Penh Intl. Airport (VDPP) for FS2004. Now available to purchase at SimMarket. QualityWings has posted new virtual cockpit previews from the BAe146/Avro RJ for FSX and FS2004. McPhat Studios posted a promotional video for the PMDG Boeing 747 World Airliners 1 High Definition Textures (HDT). Another video has been posted of Orbx CityScape Canberra for FSX in the R-22 simulator. Christer Häberli has released the freeware Ljubljana Airport (LJLJ) for X-Plane. Download at X-Plane.org. The International X-Plane Engineering Group (IXEG) has posted this W.I.P. 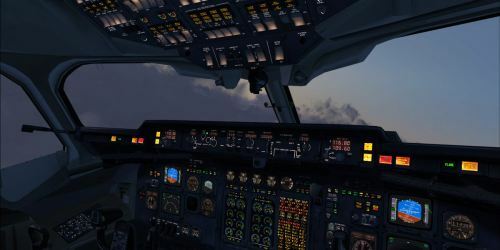 picture from the Boeing 737-300 for X-Plane. Several new preview screenshots have been posted from the Airbus A340-300 for X-Plane. Dreamfoil Creations has posted more preview pictures from the upcoming Robinson R22 for X-Plane. Take On Helicopters Community Preview build 84010 is available. Note: Arma 2: Operation Arrowhead is required. The Flysimware 1947 Cessna 120 3D for FSX is now available to purchase at SimMarket. Laminar Research has set the release date for X-Plane 10 at Christmas 2011. Read the announcement. McPhat Studios posted a promotional video for the Level-D Boeing 767 World Airliners 5 High Definition Textures (HDT). IRIS Flight Simulation Software has announced the Alenia C-27J Spartan for FSX. View previews here. New preview pictures has been posted from the upcoming Bangkok City Scenery for FS2004. Commercial Level Simulations (CLS) has posted the first preview pictures from the BAe 146 for FSX. Eiresim has posted the first preview pictures from the upcoming London Luton Airport (EGGW) for FSX. CaptainSim has posted another screenshot of the upcoming Boeing B737-100 for FSX in Lufthansa livery. Aerosoft has updated Keflavik Airport (BIKF) for FSX and FS2004 to version 1.01. View Product Page. Aerosoft has posted another preview pictures and status update on the OV-10 Bronco for FSX. Aerosoft is holding a 20% off on all German Airports weekend sale. Valid thru August 29th 2011. Neil Wing has released the freeware Sabiha Gökçen International Airport (LTFJ) for FS2004. Download at AVSIM. Freeware Randall Airport (06N) Middletown, New York for FSX is available to download at Simviation. The freeware Privolzhskiy Airbase (UPWA) scenery for X-Plane is now available to download at AVSIMrus. Aeroplane Heaven is developing the Vickers Viscount for FSX. Preview screenshots at the Just Flight product page. Carenado has posted several cockpit lighting previews from the Cessna C337 Skymaster for FSX. Navigraph NAVData AIRAC Cycle 1109 is now available for purchase at Navigraph or SimMarket. Orbx has posted the first preview images from the upcoming Anacortes Airport (74S) for FSX. Orbx has posted new texture previews from the upcoming FTX New Zealand South for FSX. The Romania Scenery Design Team (RSDT) has released freeware Romania VFR Prahova Valley for FS2004. Baja Sim has posted new preview pictures from La Paz, Baja California Sur (MMLP) for FSX and FS2004. New HEMS interior previews from the MD Helicopters MD-902 Explorer for X-Plane. The developer of the Learjet 23 for X-Plane has posted new preview screenshots in the X-Plane.org Forums. FranceVFR Pays-de-Loire Photo HD for FSX is now also available to purchase at SimMarket. High resolution photoreal scenery covering a French region. 0.85 to 1 meter resolution ground texture made from aerial photography (IGN) retreated for an optimal visual rendition in FSX (summer only). High resolution real 19 meter (LOD11) optimized custom mesh incuded. All lakes and rivers have been entirely cut out and faithfully represented, reworked with bodies of landable water. Water transparency effects for the whole scenery coverage. Optional Waterclass and original water texture provided. Extremely precise geo-referenced texture positionning is carried out in order to ensure a maximal compatibility with scenery add-ons for this region. HiFi Technologies has released Active Sky Evolution Service Pack 3 for FSX and FS2004. causing unnecessary resets and refreshes. - Improved interpolation of precipitation types snow/rain, so that rain will not be improperly depicted when temperatures indicate freezing. - Added new “Force ATC Wind Lock” option. When enabled, surface winds will not change, and ATC runway assignment conflicts should be avoided. in order to allow the wind to update to the latest conditions before arrival, but only once. - Fixed problem on server relating to 116 “lingering” stations that were providing stale aloft data. - Fixed problem with aloft interpolation logic that would cause improper wind directions in some cases. Eagle Rotorcraft Simulations has posted new preview pictures from the upcoming Bell 222 for FSX. Orbx has updated the FTX Pacific Northwest Demo to version 2, now includes freeware Bowerman Airport (KHQM). Orbx has released the freeware Bowerman Airport (KHQM) scenery for FSX. Available as stand-alone download (PNW.004 required) or with the updated FTX Pacific Northwest Demo V2. 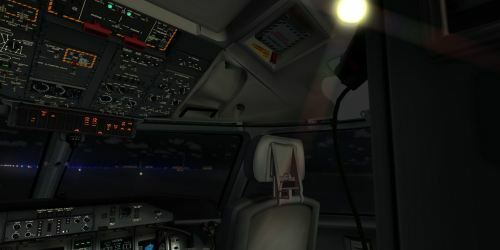 Samdim has posted several virtual cockpit lighting previews from the upcoming Majestic Software Dash 8 Q400 for FSX. Aerosoft has updated the Diamond DA20-100 'Katana' 4X to version 1.02. View Product Page. California Classic Propliners has updated the freeware Lockheed L-188 Electra for FS2004. JRollon has posted the first virtual cockpit preview renders from the upcoming Airbus A320 for X-Plane. Eagle Rotorcraft Simulations has posted new preview pictures from the Bell 206B JetRanger III for FSX. VertigoStudios 30% off Big Summer Savings Sale at the PC SimStore. Valid until August 30th 2011.